Recently, I was at a free “Boost Your Business” training organised by She Leads Africa and Facebook. The class focused on how to use Facebook tools to grow one’s business. It was a great time to meet other people and learn something new. One of the questions asked after the training was how to pay for Facebook adverts. Apparently, paying for Facebook ads has not been a smooth process for many users. While Facebook started showing advert rates in Naira last year, there has been complaints of paying in naira. It is believed the rates shown are as a result of Dynamic Currency Conversion (DCC) which differs from bank rates. In the light of this, paying for ads in naira has been almost non-existent. Another hindrance to paying for ads is the naira-dollar fluctuations. Certain banks have totally barred their debit cards from international transactions. Those who allow transactions place monthly restrictions or may take some time before they go through. Therefore, even if your FB advert rate is in dollar, your bankcard may still be rejected. Seeing this challenge, I did a small research on how you can pay for your Facebook ads in Nigeria. With a prepaid dollar debit card, you pay into the card (in naira) at a certain exchange rate. The money in the card (now in dollars) can be used to pay for goods and services online. Not all banks offer this service and some who do may you the card is out of stock due to low patronage. In any case, confirm from your bank if they offer prepaid dollar cards. I was able to look up those for Stanbic IBTC and Access bank. You may be asked to deposit some money after opening the account. To get the debit card, you’ll indicate it when filling the form. Bank charges may apply. With naira debit cards, you pay the naira equivalent of the dollar price. Bank rates at the moment are around ₦375 to a dollar, As stated earlier, most banks barred their cards from international transactions. For now, the best bets are Access Bank Visa card and GTB MasterCard. I spoke to a friend and he told me he used either of the two options for his Facebook ads. A distant third would be UBA MasterCard, which is rumoured to work best at certain times of the day. PayU is a payment gateway that allows you to prepay your Facebook ads account. With PayU, you pay in naira which is preloaded into your ads account. From there, you may decide how you want to use the funds until it is exhausted. The option to pay via PayU may not show if you change the currency of your Facebook ad account. Creating a new Facebook ad account may not bring the option either. A remedy to this is to create another Facebook profile and a new advertising profile tied to PayU. You may then make your old Facebook account an advertising admin to run ads with it. PayU is perhaps the only option of the above which allows paying for Facebook ads shown in naira. Others require you to pay the naira equivalent of the dollar rates. 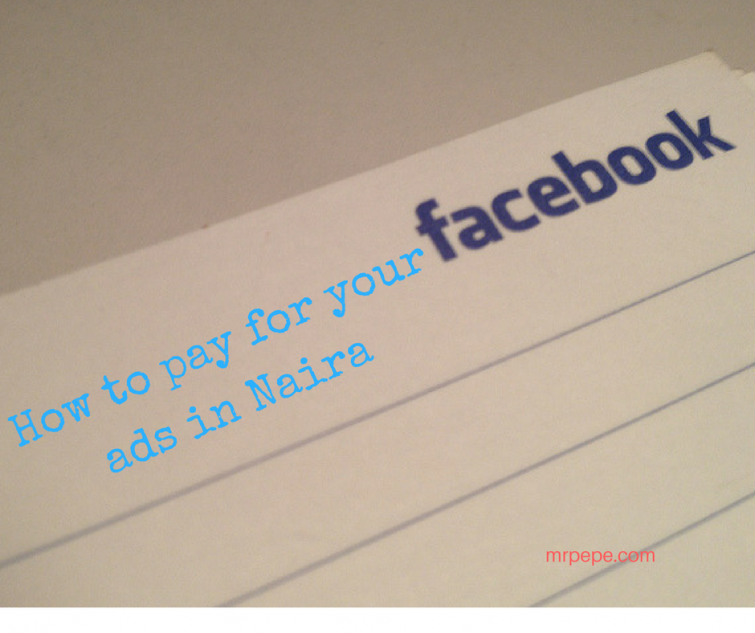 These are some of the surest ways to pay for your Facebook ads in Nigeria today. Please share if you pay for Facebook ads using other methods using the comment box below.